Corporations from industries as diverse as agriculture, manufacturing, logistics retail and financial services are being disrupted at an unprecedented rate by a variety of innovations. From technological breakthroughs in cloud computing and big data analytics to disruptions like crowdfunding and social engagement, most of these innovations are created by startups, including many that are based in Silicon Valley. As corporations attempt to address the implications of these disruptions and become more innovative, they are trying to determine how to interact with and benefit from the startup ecosystems creating these innovations. In this series of posts I will present and discuss a new model for corporations to use as they consider disruptive innovation. The model is very much influenced from my experiences over the past 25 years in Silicon Valley as an entrepreneur, startup and large company executive, and investor, as well as by the interactions on this topic I had with over 100 corporations over the past three years. The term innovation has a different meaning for each of us. First we have to recognize that there are innovations used to keep an existing product or service competitive, the so-called sustaining innovations, and innovations that alter or disrupt markets, or disruptive innovations. Innovation is the transformation of what is possible to something valuable. The word “possible” means we are looking to capitalize on what is known and what we can create from what is known. Innovation may involve invention, but the two are not synonymous. The word “transformation” implies a focus on execution. The world “valuable” implies that we are looking for transformations that provide value. To be effective, innovation must be continuous and must involve the solution to a problem — perceived or still unperceived. Disruptive innovation is the innovation that can change industry structures and, in the process, alter technologies, business models, and other characteristics. Amazon was a disruptive innovator in the book-selling industry, Apple disrupted the music industry, and Salesforce is disrupting the enterprise software industry. While sustaining innovation is about maintaining, prolonging and even improving the life of a successful technology, process or business model, disruptive innovation is about the desire to create new value. For example, Gilette introduced a disruptive innovation that consisted of technology and business model. The multi-blade shaving system was a disruptive technology and so was the business model that called for giving away the pole for free, and charging for the shaving cartridge. Gilette then followed this disruption with a series of sustaining innovations that allowed the company to introduce cartridges with more blades, lubricants, etc, and then further extended their initial innovation to a new market (women). 1. Growth: A dichotomy exists today in the corporate world: productivity alone does not lead to growth. As the reports published in Deloitte’s Shift Index series, have shown, while worker productivity is at an all-time high (see Figure 1), the innovation gap — or disparity between the benefit from worker productivity and the growth in core technologies such as information technology, biotechnology and materials technology — has been increasing (see Figure 2). 2. Return On Assets: Moreover, corporations are not providing more value to their shareholders. The trend line for the Return on Assets (ROA) index (see Figure 3) clearly demonstrates that the value corporations provide to their shareholders is decreasing. Today’s growth is coming from innovative companies such as Apple, Google, Amazon, Netflix, Salesforce and others that have disrupted their competition by using technology. 3. Corporate Leaders Lifespan: Furthermore, as shown in Figure 4, the average lifespan of an S&P 500 company continues to decline. Corporations that were considered leaders in their industry are more likely to be disrupted now than ever before. To put it another way, staying at the top is becoming harder. As more business processes are becoming digitalized across almost every industry — from hospitality and real estate to transportation and agriculture — newcomers with expertise in software, internet and data technologies have a greater opportunity to disrupt. The customer base (consumer or enterprise) is ready to utilize innovation, accelerating the incumbents’ disruption. Traditionally the R&D and Corporate Strategy organizations were tasked with “looking over the horizon” — analyzing market developments, applying emerging technologies and exploring trends to identify potential disruptors to the corporation’s business. Corporate Strategy would formulate one or more plans for moving the business forward, taking into consideration the over-the-horizon findings. R&D would create and patent the disruptive innovations, addressing important existing and anticipated problems and utilizing plans and findings from the Corporate Strategy organization as needed. Think of storied R&D organizations such as Bell Labs, 3M, Xerox PARC, and Kodak Labs — their work was always driven by technology. However, during the last 15-20 years, corporate R&D organizations have become limited to providing sustaining innovations that protect and prolong the life of existing products, revenue streams and business models. IBM’s mainframe computer business, one of the company’s primary revenue and profit generators, is an excellent example of this trend. Each new generation of mainframe computer released by IBM incorporates several technology innovations, many produced by IBM’s R&D organization. However, the business model for this product line has remained unchanged. The technology innovations in IBM’s mainframe computers are aimed at sustaining the particular business and protecting the financial characteristics derived from its long-running business model while providing value to the customers that continue to rely on these computers for the past 60 years to run major parts of their business. In part because companies have outsourced R&D, reduced it, or completely transformed it to advanced product development, the ability of corporate R&D to anticipate technology-driven disruptions is lagging, while the general pace of such innovations is accelerating. For example, consider the disruptive innovation pace of companies like Google, Apple, and Amazon, and compare it to that of AMR, Gerber and Best Buy. Even more importantly, today’s disruptors are not relying on technology innovation alone. They are combining it with business model, sales model, and other types of innovation to produce the disruptions. Consider Salesforce.com and Tesla Motors: by utilizing technology, business model and sales model innovations, they are disrupting the enterprise software and automotive industries respectively. 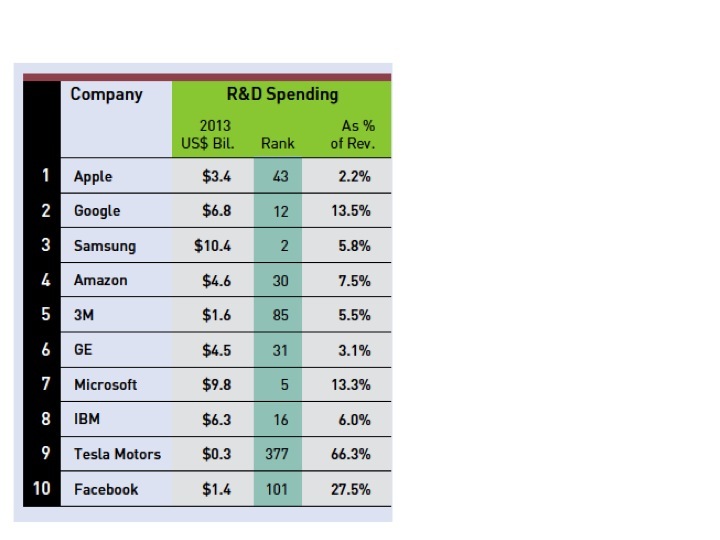 More importantly, high R&D spending is no longer a necessary and sufficient condition for making a company a disruptive innovator (see Figure 5 for the 2013 ranking of corporations based on the amount they spend on R&D). 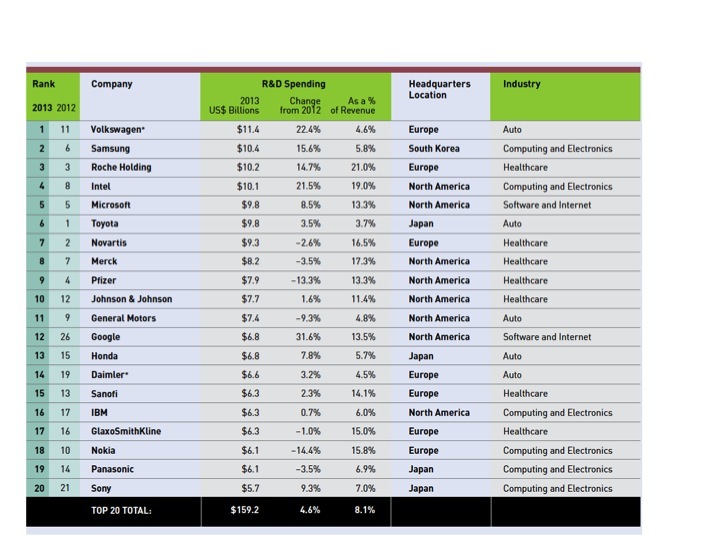 The annual surveys of Global 1000 executives conducted by Booz & Co demonstrate that with few exceptions, a small number of the companies with high R&D budgets are considered disruptive innovators, since only four of the companies in Figure 5 are included in the list of the top 10 most innovative companies (see Figure 6). It cannot keep up with technology: The existing R&D model cannot keep pace with exponential technologies and the accelerating pace of information technologies (cloud computing, big data, mobility, internet of things, artificial intelligence), biotechnologies (genomic analysis, precision medicine), and materials (nanomaterials, 3D printing). Many of the innovations in these technologies become building blocks to innovations in industries such as automotive, manufacturing and hospitality. Innovation is generated globally: Corporate R&D alone cannot address the reality that disruptive innovation is now created by thousands of startups from around the world (see Figure 7). Funded by VCs as well as several other sources (as shown in Figure 8), they are not necessarily contained to specific research laboratories. In addition to Silicon Valley, Boston, Israel, London, Berlin, Bangalore, Beijing and other places around the world have emerged as significant innovation clusters. R&D is slow to determine product/market fit: Traditional R&D does not — or by its mission is not able to — combine technology with business model innovation, while still focusing on customers and solutions. Methodologies such as Lean Startup, Design Thinking and Minimum Viable Product enable startups to quickly iterate and find the right product/market fit. Abundant capital is enabling the formation of more startups: The old model is slow to respond to today’s rapidly changing market conditions, regardless of how much the corporate parent is willing to invest in R&D. Abundant capital from institutional venture investors, private investors, and other sources enables the formation of a large number of startups that are constantly altering the market dynamics. Our hyperconnected world is amplifying the effects of these companies and causes them to have global impact, as seen with Uber and Airbnb. Collaboration with internal groups is cumbersome: It cannot properly align technology innovation with business model and other types of innovation. The way many corporations set up their R&D organizations makes it difficult for R&D to work with corporate strategy and other pertinent groups to combine technology with other types of innovation. It uses the wrong success metrics: It lacks well-defined ROI metrics to assess its value to the corporation and customers. As a result, traditional R&D often reverts to softer success metrics, such as number of patents obtained per year as Key Performance Indicators (KPIs). In a later post we will discuss the right way to think about innovation KPIs. and assess the effectiveness of each innovation through KPIs that are appropriate for the type of innovation and the corresponding timeline. The innovation model I am proposing is startup-driven and is influenced heavily by my 25-year experience in Silicon Valley founding, operating and investing in high-tech startups. It has also been shaped by the advisory interactions on innovation I had with over 100 corporations over the past three years. Determine the type of innovations it will pursue. Is it looking for innovations to maintain existing business models, extend these models to adjacent markets, or for innovations that will disrupt existing models and create new ones? Determine whether in the process of pursuing disruptive innovations, it will look both inside and outside its four walls. Moreover, whether looking outside its four walls will include working with startups. The innovation model I’m proposing provides the foundation on how corporations can innovate with startups and by applying approaches pioneered by and used in startups. The model incorporates cultural, organizational and financial elements. Cultural: Innovation can come from anyone within the corporation, i.e., the corporation’s intrapreneurs and not only the R&D organization, as well as from outside the corporate four walls, particularly from startups and their entrepreneurs. In addition, the corporation must foster innovation-driving behaviors not only in the organizations leading innovation initiatives but in every other organization. Organizational: The corporation, in addition to R&D, must create specific groups, that we call innovation enablers, whose mission is to enable innovation by taking advantage of opportunities created by intrapreneurs, entrepreneurs and in startup ecosystems. Among their goals these groups must identify the right startup ecosystems to access talent, technology and know-how. Collaboration among these groups is not a “nice to have,” but an absolute requirement that is rewarded with the proper incentives. These groups operate under a single executive leader, the Chief Innovation Officer. Financial: In addition to its R&D budget, the corporation must allocate sufficient capital for the variety of investment types in the selected startup ecosystems and for providing incentives to its innovation enablers. Determine the innovation goals they can achieve by working with startup ecosystems. Establish the timelines for achieving these goals and the target ROI. Identify the way their innovation enablers should collaborate among themselves and with existing business units. Set up each innovation enabling group, e.g., the corporate venture capital group, in a way that can achieve the stated goals. At the heart of the model are four organizations which corporations must create and bring together under a single leader. These organizations are the innovation enablers and include corporate venturing, incubation, startup R&D, strategy and corporate development, and business development. Innovation-enablers are just that: they enable innovation; they don’t constitute innovation. Therefore, a corporation cannot claim that it is innovating just by creating these groups. However, under a single accountable leader and through the continuous collaboration among the innovation enablers, corporations will not only improve their internal ability to innovate and anticipate disruptions, but they will also be able to access and effectively utilize the disruptions created by various innovation ecosystems. We are already seeing successful early results that are realized by the collaboration among these four innovation enabling organizations in Qualcomm, Samsung, Telstra and Singtel. Incubate: They incubate the ideas of their intrapreneurs and outside entrepreneurs by providing the right environment, structures and seed capital to establish and grow startups outside the corporation. Eventually the most successful and relevant startups should be spun back into the corporation. Invest: They make various types of investments, including venture investments, often in collaboration with institutional investors. Acquire: They acquire innovative companies regardless of their size, even when significant revenue may come a few years after the acquisition. Consider Google’s acquisition of Nest or Facebook’s acquisition of Oculus. Partner: They pursue strategic business development to enable partnerships with small and large companies that provide strategic advantage. For their innovation efforts to be successful, corporations must establish appropriate timelines for achieving their goals through incubation, venture investing, acquisitions and partnerships must measure the results of these efforts through specialized Key Performance Indicators. For example, corporate investments in early stage startups working on information technologies should have 7-10 year timeline to ROI, consistent with the timeline institutional venture investors establish for startups of this stage. Establish the innovation enablers as integrated rather than silo organizations. Empower and require these organizations to collaborate effectively and continuously. Require them to constantly interact with the corporate business units in order to understand problems that will require breakthrough solutions and to keep them updated on the innovations they are identifying through their investments, and incubation efforts, as well as through opportunities for partnerships and acquisitions. These organizations and their expected interactions (see Figure 9) must be optimized around commonly defined goals, timelines, and KPIs, and be strategic and proactive. The innovation enablers must also have the constant support of the corporation’s executive management and even its board of directors. It is very instructive to understand how the new innovation leaders such as Google, Facebook and Amazon, but also older companies such as Samsung and GE have incorporated these principles into their innovation work. For example, Google Ventures, one of the most active corporate venture investors, closely collaborates with the company’s corporate and business development organizations, as acquisitions of companies like Nest clearly demonstrate. Moreover, to promote intrapreneurship, Google organizes engineers in small teams and allows them to develop new ideas for a period of time every week. Qualcomm has used its innovation-enabling groups to address one of its strategic opportunity areas: robotics. The company’s CTO-led the innovation initiative (single leader). The initiative engaged four internal groups, including R&D and corporate ventures. The focus on robotics developed when the venture group collaborated with R&D to find adjacent markets for Qualcomm’s Snapdragon processors. The innovation-enabling groups quickly concentrated on robotics because that field can use many of the technologies Qualcomm has already developed for mobile phones, such as motion sensors, GPS, GPU, and computer vision. Qualcomm established short, medium and long-term goals for this innovation initiative, with the associated timelines, and then addressed them strategically. In addition to starting a new R&D initiative, Qualcomm acquired KMel Robotics to address its short-term market opportunity. It invested in 3D Robotics to address its medium-term goal (ROI in 4-6 years). To address its long-term innovation goal (ROI in 7-10 years), Qualcomm established the Qualcomm Robotics Accelerator in collaboration with Techstars, where it is currently incubating 10 startup teams. Taking advantage of technology breakthroughs: Silicon Valley-based companies have repeatedly demonstrated that they can develop more disruptive innovations particularly in the areas of software, Internet, and big data than any other startup ecosystem worldwide. For example, Silicon Valley-based startups have already created technologies such as software-defined data center; disruptive software applications such as cloud-based CRM and various Internet and mobile applications (both for the enterprise and the consumer); big data infrastructure software such as Hadoop; and big data applications for industries such as retail, manufacturing and automotive. Taking advantage of business model breakthroughs: In addition to disruptive technologies, Silicon Valley-based companies create novel business models, such as Software as a Service, online advertising and car sharing. It can also create more sales models such as the inside sales model, and marketing models like social marketing. Taking advantage of best practices: The members of Silicon Valley’s ecosystem have developed — and continue to develop — best practices for: venture investing; building entrepreneurial teams and enabling them to reach their full potential; managing portfolios of startups; navigating hypercompetitive and fast-evolving markets with agility; growing the most successful startups while pruning the ones that cannot scale; and finally successfully exiting from these investments through public market offerings or acquisitions. Corporations have begun to recognize the importance of entrepreneurship, the startup culture and venture capital in the creation of disruptive innovations — and they are accepting Silicon Valley as the place where over-the-horizon disruptive innovation and change are happening. Even corporations from industries as diverse as consumer packaged goods and automotive have started engaging broadly with its ecosystem, though not exclusively as New York and Israel are also attracting attention from corporations in these industries. More specifically, corporations establish a presence in Silicon Valley for one more of the following reasons: exposure to ideas; inclusion in startup deal flow; access to the talent pool; partnership opportunities with local companies (private and public); acquisition and investment opportunities; and to understand the Valley’s innovation-creation culture. Corporations look to the members of the Valley’s ecosystem, particularly the venture investors, the startups and the established companies that were once venture-backed, for best practices in identifying entrepreneurs and building entrepreneurial teams; investing in them; managing portfolios of investments and driving them to success; as well as in partnering with companies in the ecosystem. To date over 800 corporations have established a presence in Silicon Valley, and more are projected to do so in the next 12 months. Venture funds, such as Comcast Ventures, which collaborate with local institutional venture investors and invest in their portfolio companies. Incubators that provide entrepreneurial teams with resources like office space and mentors as they try to develop solutions that address what the corporation thinks are important existing or future problems. ATT Foundry is a good example. Accelerators, such as Samsung’s Open Innovation Center. In addition to what is offered by incubators, accelerators also provide seed funding, typically to intrapreneurs. Business development offices, which develop partnerships with Silicon Valley-based companies that are viewed as strategic to the corporation’s goals. Deutsche Telekom has established a business development office for such purposes. Specialized R&D centers, such as Daimler-Benz, which capitalize on the local technology talent in order to create disruptive innovations. Some corporations, such as Samsung, have established all of the above. However, the majority of the companies run these organizations as independent entities with little or no collaboration among them, rather than as high performance, integrated disruptive innovation-creation engines. And certainly they are not bringing these organizations under a single leader. Ensure broad leadership support: There must be broad and strong executive support for the new innovation model. The C-Suite (CEO, Chief Strategy Officer, CMO and Chief Digital Officer) leads these efforts with the board’s active involvement, but it constantly seeks the engagement of every corporate layer. The CEO must not only understand that part of the disruptive innovation model involves searching and identifying the appropriate business model, but, as it happens with startups, these innovation efforts carry significant risk of failure, take a long time to produce significant and enduring financial results, and the road to their success is never a straight line. Determine the type of innovations to be pursued: Recognize that disruptive innovations require a different approach than sustaining innovations. If pursuing disruptive innovations and looking outside the corporate four walls, determine if working with startups is important to the identification of such innovations. Understand the importance of innovation culture: The corporate culture will contribute positively and negatively to innovation efforts, and leaders must be prepared to lead a culture shift if necessary. Establish the appropriate budgets: Allocate sufficient capital for the variety of innovation-enabling activities in the selected startup ecosystems and for providing innovation success incentives. But recognize that while consistent and adequate funding is necessary, it does not guarantee success. Funding may need to be modulated based on the results produced by these innovation efforts, much like it happens in the case of startups. Employ the right people: The corporation assigns a single executive to lead all these efforts, measures the executive’s effectiveness and rewards the executive in a commensurate manner. The innovation-enabling organizations are staffed with the people who have a passion for these activities and understand how to engage with the ecosystem. Establish the right timelines: Establish the right timeline during which to measure success, and make it consistent with other corporate timelines. Large corporations often cannot understand long timelines, whereas institutional VCs do. The long time horizon is often in conflict with the typical tenure of corporate executives, including the CEO, which tends to be 3-5 years. Use appropriate KPIs: Establish the right metrics and KPIs for assessing the risk and the performance of each of these innovation-related initiatives. Financial return by itself is not the right metric. Nurture intrapreneurs: Support intrapreneurs and help them develop their internal startup ideas, rather than paying attention only to external startups and their teams. Learn to incorporate success: Understand how to best integrate successful results back into the business units given a particular culture since there may be strong resistance to such integration, particularly by middle management. We have entered a period characterized by breakneck innovation pace occurring in many fields and impacting all industries. The existing corporate innovation model that is based on the contributions of the corporate R&D organization is no longer sufficient to address today’s challenges. We are proposing a new model for driving corporate innovation that integrates venture investing with incubation, business development and corporate development and is shaped by our experiences in and best practices of Silicon Valley’s ecosystem. In a series of posts we will provide the details of this model and provide examples of how it is being used and can be used successfully by corporations across industries and geographies. Great post about disruptive innovation and how companies can benefit from it!